New York Restaurant Week is twice-annual, when many restaurants have specific discounted prix-fixed menus. This time around, it goes from July 20th to August 4th and, being a little inspired by Michelle Tran's restaurant posts, I decided to take pictures of my meal. My best friends Nali and Jessi and I went to Lafayette, a French bistro on Lafayette and Great Jones in NoHo, Manhattan--not our usual neighborhood and not our usual fare. Which is the point of Restaurant Week! Lafayette has a bakery in front--and a bar tucked into a corner, from which I ordered a cocktail called the Raspberry Fix. It was fizzy and fruity and sweet. I drank that first one wayyy too quickly. Nali tried a sip and said it tasted like Tang. :-) It was on the lighter end of cocktails, almost tasted like soda, and therefore, I was buzzed rather quickly. 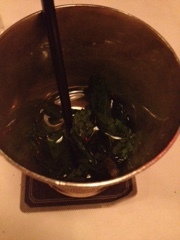 Nali ordered a mint Julep. 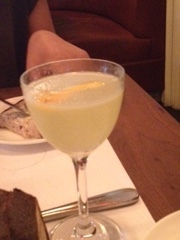 Once we were seated in a comfy corner booth, Jess ordered a drink called the French Melon, which tasted much more of lemon than melon, but was pretty yummy. 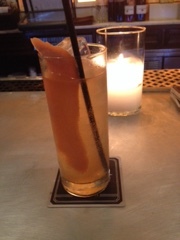 I think we cooed as we took sips of it. So we ordered. Nali is a vegetarian, so her meal was pretty set by the menu: salad (which was huge), heirloom tomato risotto (delicious), and then a dark chocolate ice cream bon bon, which looked very good (and so full of dairy). 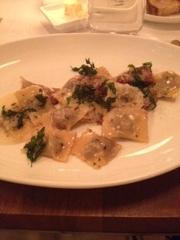 Jessi had the glazed pork belly for a starter, then the short rib ravioli, then the dark chocolate ice cream as well. 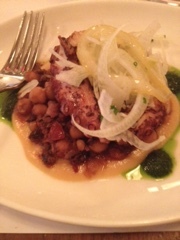 Grilled octopus on chickpeas with fennel and two sauces--one of them was pesto. So good! Also super good, but it was about the same size as my appetizer. Just sayin'. 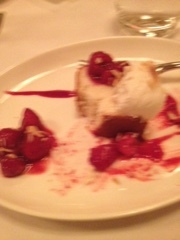 This was my dessert, the the almond chiffon cake with raspberries and chantilly cream. The right size for dessert, spongy but not too sweet, and the cream went well with the slight bitterness of raspberries. However, dinner would never be complete without the often-random and varied conversation and company of my buddies. Fun times! It all looks really good. I very rarely have anything interesting to take a picture of, though I do take a picture of new recipes that I try out and love. Your comment box isn't showing up! So I had to tag onto Krystal's comment :) That ravioli looks so good! My mouth started to salivate. Love French food! I'm going to a French restaurant this weekend, so I hope it's as good as yours! Yeah, it was good stuff. I'm *not* particularly a foodie and so, I'll probably not to taking picture of my food again any time soon, but it was fun to have something different! I love food! It tastes soooo good. Surprise, surprise, my favorite is Mexican food. That and gourmet burgers. YUM! Have you eaten at Slater's 50/50? It's 50% bacon and 50% beef. I don't love pig, so I steer away from the 50/50 options. Still, they have a great and delicious selection. I eat mostly Japanese food--surprise, surprise. Slater's seems to be a West Coast thing. Do you guys have Shake Shack out there or Smashburger? Those are pretty gourmet-ish burgers in the city. Yum! We don't have Shake Shack. I never thought of Smashburger as gourmet-ish, reminds me of 5 Guys and In n Out (IMO, In n Out is the best of all those three, btw, you *have* to try it. Way better than McD's and I love the simplicity). I haven't participated in Restaurant Week in San Diego, but perhaps I should! In n Out doesn't exist here, either. We have a 5 Napkin Burger--sit-down restaurant. It's in the city. I've never been. And the burgers at Jackson Hole Diner were pretty awesome.